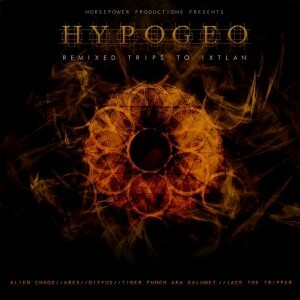 HorsePower Productions proudly presents Remixed Trips To Ixtlan, a collection of five remixes of Trip To Ixtlan, a dark progressive psytrance track by HypoGeo, one of the modern masters of the style, originally released on his debut album “Tree Of Lies” on Zenon Records. Featured here are some of the HPP crew’s favorite artists, all of whom bring something unique to the table when mixing their ideas with the HypoGeo vibe. With a range of BPMs from 130 to 160 there are many different styles presented here, from classic dark progressive psytrance to full-power darkpsy. Mastered by Anti-Logic, Berlin, with artwork by Johan AKA Shamantra. MP3 Download | FLAC Download | WAV Download · Download count: 10,301. Kudos to all remixers , you’ve all done a stellar job ! BUT thanks to all the artists, you did a great job – all tracks are so individual and with much soul! Deep and chunky. Each track is varied, its own unique flavor and yet the album pulsates with that funky, unique Zenonesque style. Awesome job! !